Junction of Brindley's Coventry and Oxford Canals of the 1760s, modified in the 1830s. Taditional mooring of working narrowboats. 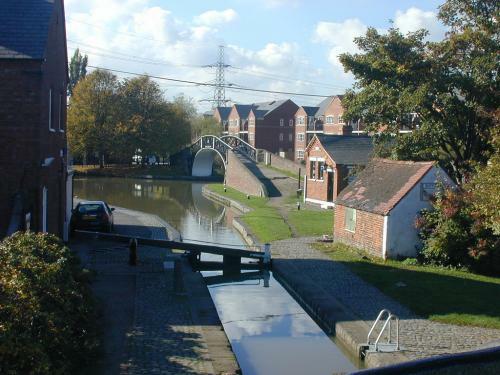 The Coventry Canal was begun in 1768 with the aim of opening up the North Warwickshire coalfield for development. The more visionary James Brindley saw it as part of the "Grand Cross" - a major route connecting London and the south with the rapidly expanding industrial centres of Northern England, via the large waterway systems of the Rivers Thames and Severn in the south, and Rivers Trent and Mersey in the north. By the end of 1769 the first boatloads of coal were passing through Hawkesbury between Bedworth and Coventry's Bishop Street Canal Basin. The Oxford Canal was started at Longford in 1769, the first 17 km (10 miles) being completed by 1771, including the Hawkesbury section. 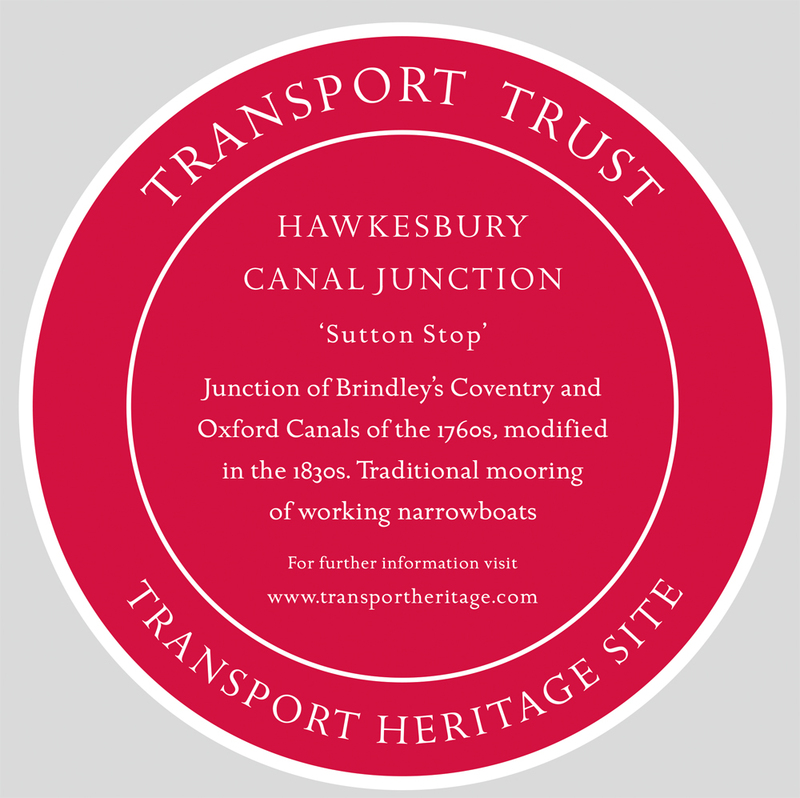 As the Coventry Canal Company and the Oxford Canal Company failed to agree about tolls, the two canals ran parallel to each other - only a few feet apart - from Hawkesbury to Longford. 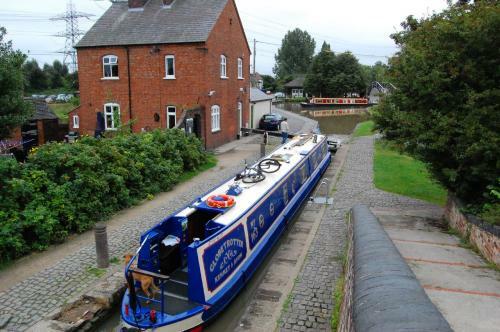 Following a court injunction taken out by the Coventry Canal Company, the two canals were joined in 1777 at Longford. 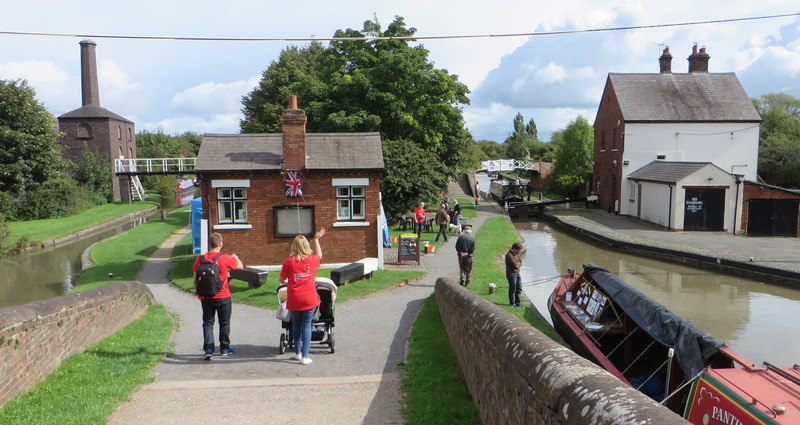 Hawkesbury Junction is the northern limit of the Oxford Canal where it meets the Coventry Canal, near Hawkesbury Village, Warwickshire. 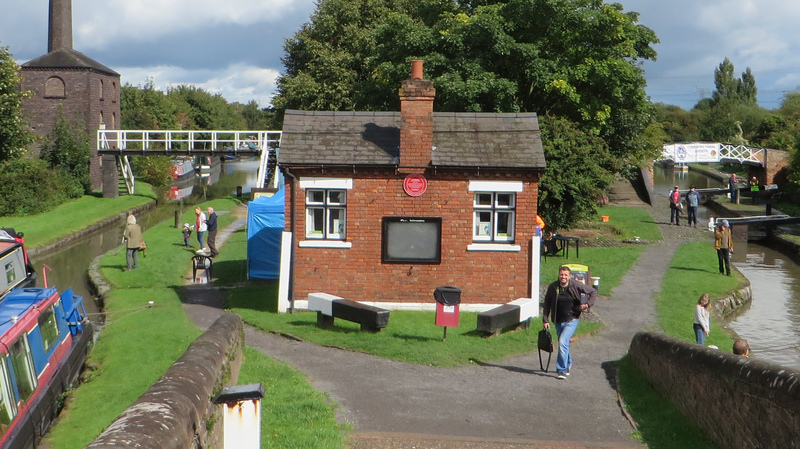 Its alternative name, Sutton Stop, arises from the name of a family which provided several lock keepers there in the nineteenth century. In commercial carrying times, the junction was a major rendezvous for working boats awaiting orders for their next cargo from the many pits in the area. A stop lock on the Oxford Canal isolates the water levels of the two original canal companies, with the Oxford being a few inches higher. The most immediately striking feature in what is now a conservation area is the elegant bridge over the actual junction of the two canals. 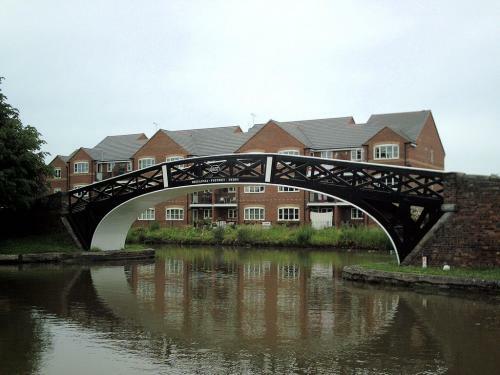 This cast iron structure is a fine example of the Victorian engineer's art, and has a span of 15.2 m (50 ft). 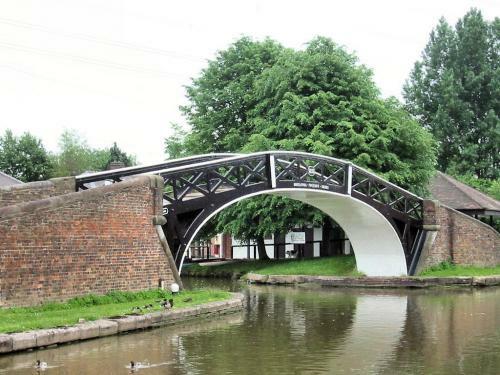 The bridge was cast at the Britannia Foundry in Derby, and was erected for the Coventry Canal Company in 1837, at a cost of £630. The abutments are made of red hand-made bricks with a semicircular blue brick coping - this style of bridge, and combination of materials, was adopted between 1800-1840 on some of the Midlands canals; their use in this bridge shows a lightness of design unexpected with such heavy materials. 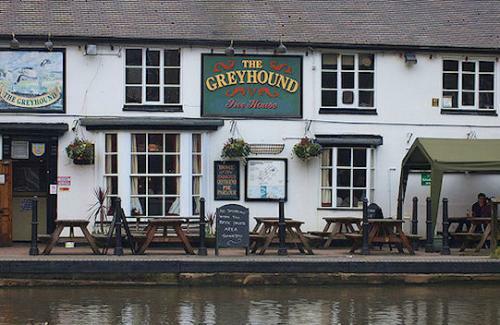 The Greyhound Inn and 18, Sutton Stop form a two storey terrace with smooth rendered walls and "rusticated quoins". Both are listed Grade II Listed Buildings. The windows are mostly simple casements though the Inn has two bay windows on the ground floor. The main doorway has now been restored to its original position as part of the recent major renovation of the building. Inside the pub some of the old features have been retained, such as a fireplace and some high back wooden settles, and at the rear, old farm buildings are reminders that early publicans of the inn were also farmers. The engine or pump house is perhaps the most unusual and interesting of all the buildings in the conservation area, both historically and architecturally. A Grade II Listed Building, the lean-to at the rear is the oldest part and housed the first engine to be installed in 1821. This was a Newcomen type engine which had already seen around one hundred years' service at one of the local collieries. Named "Lady Godiva", it was used to raise water into the canal from a stream flowing underneath. 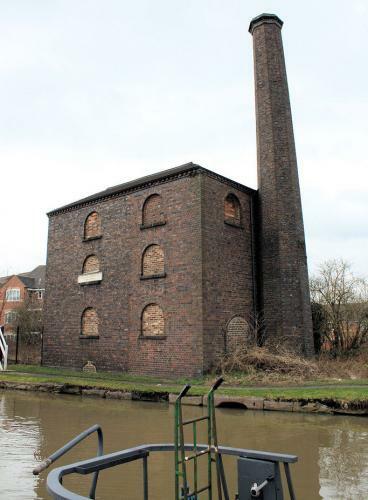 However, by 1837 this supply proved inadequate and a 35 m (114 ft) shaft was sunk and a new, more powerful engine installed alongside "Lady Godiva" in the handsome three-storey building which now fronts the canal. In 1913 this water supply failed due to the sinking of the new Coventry Colliery and the engine house fell into disuse. The newer engine was scrapped during the Second World War. 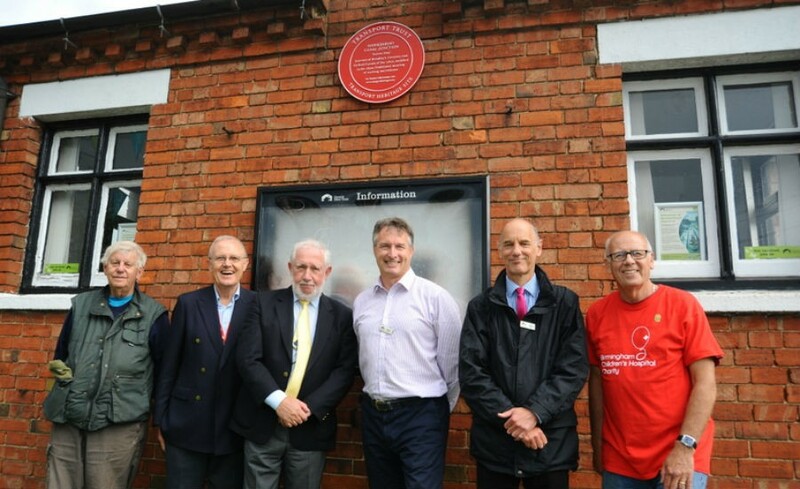 "Lady Godiva" remained in place until 1963 when it was moved to Dartmouth, the birthplace of Thomas Newcomen, as the centrepiece of a memorial museum. By road: Off A444 onto B4113 Longford Road; then Oakmoor Road, passing under M6, then first right into Sutton Stop.